The need to invest more in Europe’s infrastructure has been heavily discussed in the context of the EU’s post 2020 Multiannual Financial Framework. And rightly so – the longer-term economic performance of the EU and the global economy critically depends on the availability of adequate and state-of-the-art infrastructure (EU 2018). A large body of literature has underscored the importance of infrastructure for productivity growth (Berg et al. 2012, Calderon and Serven 2014) and for making economic growth more inclusive and sustainable (Woetzel et al. 2016, UN 2016). Investment in infrastructure in the EU is today at 1.8% of GDP, according to the EIB Investment Report 2018. This is 20% below pre-crisis levels, though the fall in infrastructure investment in recent years seems to have levelled off. The decline was most-pronounced in the transport sector (EIB 2017). Sources: EIB estimates based on Eurostat, Projectware, EPEC. Note: Based on EIB Infrastructure Database. Data are missing for Belgium, Croatia, Lithuania, Poland, Romania, and the UK. 2016 figures are preliminary. 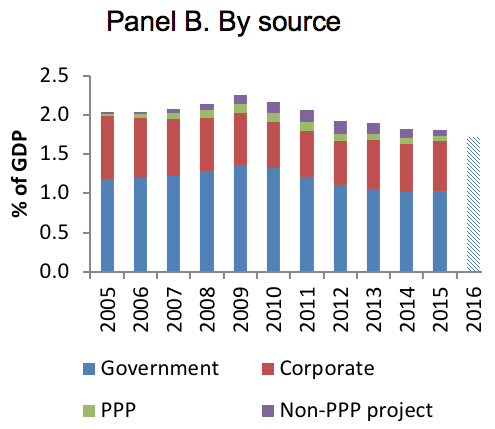 PPP: public-private partnership. Whether this decline in infrastructure investment is desirable or rather reflects a worrisome gap is at the core of a heated debate. Infrastructure investment gaps are typically defined as the difference between infrastructure investment needs, or how much countries should be spending on infrastructure and actual infrastructure investment. 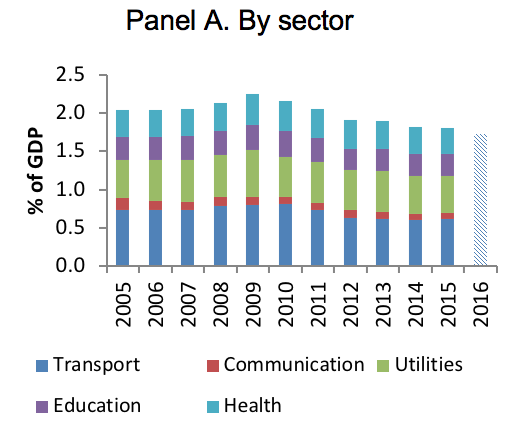 Some argue that the decline in infrastructure investment reflects a healthy saturation effect – key transport, communication, and social infrastructures are already in place in the EU. However, this perspective risks overlooking the need to replace old infrastructure, complete long overdue connections, and respond to technological advances. Several papers have attempted to estimate infrastructure investment needs and identify substantial gaps. For the world as a whole, estimated infrastructure investment needs range between 3.9% to 9.7% of GDP annually (OECD 2017, Bhattacharya et al. 2016, Woetzel et al. 2016, GCEC 2014). Annual infrastructure investment needs in Europe are estimated at 4.7% of GDP for energy, transport, water and sanitation, and telecoms (EIB 2016). The underlying methodologies vary substantially and often depend on assumptions about potential GDP growth and elasticities of infrastructure spending to growth (OECD 2017a). To contribute to the discussion on infrastructure investment needs in Europe and add a new perspective, the EIB conducted a representative survey of 555 municipalities in 2017. A key motivation for carrying out this survey was that municipalities should be well placed to assess infrastructure investment needs, gaps, and impediments in their jurisdiction. 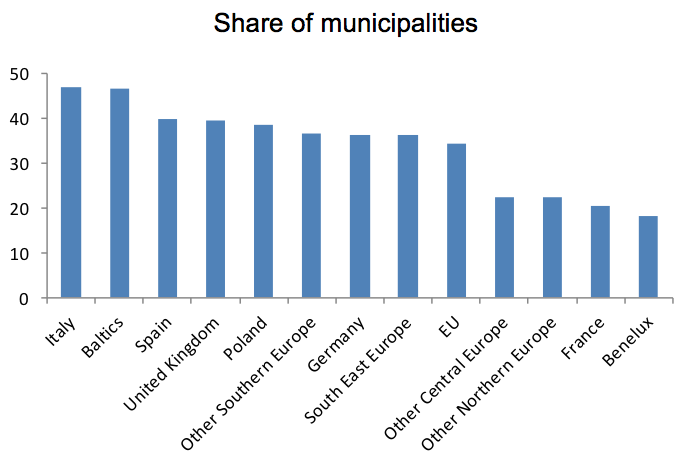 According to the EIB Municipality Survey, one third of municipalities reported underinvestment in infrastructure in recent years (Figure 2). It is important to note that this refers to infrastructure investment overall and not just the part of the infrastructure that municipalities are in charge of themselves. 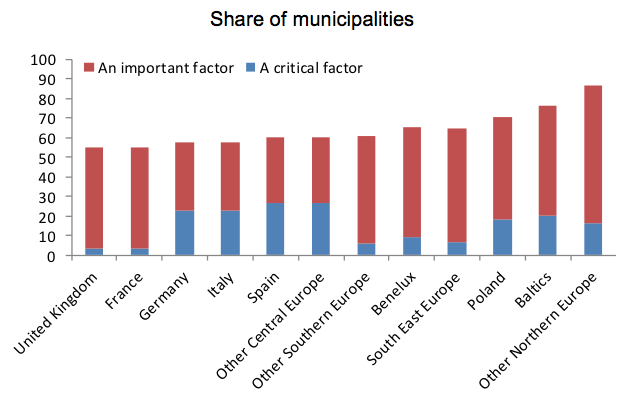 Municipalities particularly often perceive infrastructure gaps in urban transport, ICT, and social housing. Question: For each of the following, would you say that, overall, past investment in your municipality has ensured the right amount of infrastructure, or led to an under provision or over provision of infrastructure capacity? Source: EIB Municipality Survey 2017. Poor municipalities over-proportionally report infrastructure gaps. This imbalance in infrastructure investment gaps weighs on the convergence process in Europe. Macro-data support this finding by showing that the decline in infrastructure investment is particularly pronounced in countries with the lowest infrastructure quality to start with (EIB 2017). Upgrading Europe’s infrastructure is also key to preserving Europe’s competitiveness. Linking the quality of local infrastructure in the areas of transport and ICT to firms’ investment activities, a clear pattern emerges – poor local infrastructure hampers firms’ ability to respond to global growth opportunities and keep up with competition (EIB 2017, Revoltella et al. 2016). What is behind the decline in infrastructure investment in Europe? Figure 1 shows that government investment in infrastructure has declined particularly strongly. At the core of this decline is a shift in public outlays from gross fixed capital formation towards current expenditure. While in some countries, governments have recently presented plans to reverse this trend, in others, budgetary outlooks suggest a continuation of this negative development. 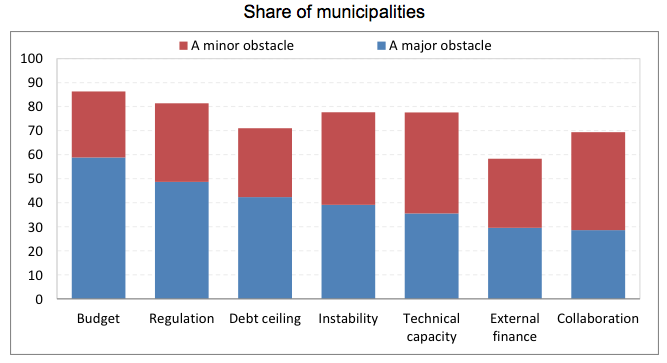 In line with this finding, when asked about the main obstacles for infrastructure investment, 70% of municipalities report fiscal constraints (budget and/or debt ceilings, see Figure 3). Among municipalities that report infrastructure gaps, 75% consider fiscal constraints to be a major obstacle. The length of regulatory processes to approve a project is mentioned by close to 50% of municipalities as a major obstacle. Question: To what extent is each of the following an obstacle to the implementation of your infrastructure investment activities? Is a major obstacle, a minor obstacle or not an obstacle at all? (1) Balance between revenues and operating expenditure; (2) Limit on amount of debt the municipality can borrow; (3) Access to external finance (excluding funding from other government bodies); (4) Technical capacity to plan and implement infrastructure projects; (5) Co-ordination between regional and national policy priorities (including among municipalities); (6) Length of regulatory process to approve a project; (7) Political and regulatory stability. Loosening fiscal constraints requires, however, mechanisms that ensure that additional investment goes into the projects with the highest social, economic, and environmental impact. The EIB Municipality Survey suggests that there might still be room for improvement in this respect – at first glance, municipalities seem to be aware of the complexities associated with an efficient allocation of resources. More than 80% of municipalities state that they have an urban development strategy. However, not all municipalities take these strategies into consideration when it comes to actual infrastructure planning. Of all municipalities that have an urban development strategy, only 72% consult this document in the process of planning infrastructure projects. Examining the importance that municipalities attribute to ex-ante assessments of infrastructure projects reveals a similar picture. Of the roughly 60% of municipalities that carry out some type of ex ante assessment, only about two-thirds consider it a critical or important factor. Consequently, less than 40% of the surveyed municipalities assess the quality of infrastructure projects prior to implementation and consider this information important in decision-making. Question: And how important would you say are the results of the independent assessment/s when deciding whether or not to go ahead with a project? Also, when it comes to the coordination of infrastructure investment activities with other bodies, there is room for improvement. Only 45% of municipalities say that they coordinate their infrastructure investment activities with the region in which they are located; and only 37% coordinate with neighbouring municipalities. More efforts are therefore needed to strengthen coordination and the planning and implementation of infrastructure projects at the EU, national, and sub-national levels to ensure effective use of public funds. The combination of substantial infrastructure gaps and fiscal constraints may require a greater involvement of private investors in infrastructure financing. Infrastructure investments have many characteristics that should appeal to institutional investors. They have a long duration, facilitate matching of long-term liabilities with cash flows, and provide opportunities for portfolio diversification because of the low correlation of returns with other assets (OECD 2011). Yet average infrastructure investment by these investors, in the form of unlisted equity and debt, accounts for only 1.1% of total assets under management (OECD 2016). The limited involvement of private investors can partly be explained by practical issues. For instance, low returns have held back corporate sector investment (Grayburn and Haug 2015). Unlike in the US, it seems that regulators in Europe did not sufficiently account for the increase in equity risk premia, which should have pushed up allowed returns. Moreover, pension funds and insurers are dis-incentivised from investing in infrastructure by a lack of data, some solvency and funding regulations, and limited investment and risk management expertise (Della Croce and Yermo 2013, OECD 2017b). It is also likely that a clear planning and prioritisation system of infrastructure projects also matters for potential private investors’ willingness to engage in infrastructure projects through PPPs or corporate infrastructure projects. While there is little doubt that more investment in the EU’s infrastructure is needed, it is equally important that the planning and implementation of infrastructure projects is strengthened at the EU, national, and sub-national levels. Effective use of public funds has to be ensured by strong coordination, planning, and implementation procedures. This is also key to attracting private investors. Just like taxpayers, private investors want to be sure that the projects they invest in are sound and well executed. In 2017, the EIB provided €18 billion to support infrastructure projects worth €55.5 billion, drawing in public as well as private investors. The European Public-Private Partnership Expertise Centre and the European Investment Advisory Hub are two initiatives that helped raise the technical capacity of many of these projects and, together with EIB financing, made them bankable. Berg, A, E F Buffie and A Cashin (2012), “Public investment, growth, and debt sustainability: Putting together the pieces”, International Monetary Fund, Working Paper WP/12/144. Bhattacharya, A, J P Meltzer, J Oppenheim, Z Qureshi and N Stern (2016), “Delivering on sustainable infrastructure for better development and better climate”, Brookings Institution, Washington, DC. Calderon, C and L Serven (2014), “Infrastructure, growth and inequality: An overview”, World Bank, Policy research working paper no 7034. Della Croce, R and J Yermo (2013), “Institutional investors and infrastructure financing”, OECD, Working Papers on Finance, Insurance and Private Pensions no 36. EIB (2016), Restoring EU Competitiveness, 2016 updated version, European Investment Bank, Luxembourg. EIB (2017), EIB Investment Report 2017/2018: From recovery to sustainable growth, European Investment Bank, Luxembourg. EU (2018), “A new, modern Multiannual Financial Framework for a European Union that delivers efficiently on its priorities post-2020”, COM(2018) 98 final, Brussels. GCEC (2014), Better growth, better climate, Global Commission on the Economy and Climate, Washington, DC and London. Grayburn and Haug (2015), “European regulators’ WACC decisions risk undermining investment decisions” in Insight in Economics 41, NERA Economic Consulting. OECD (2011), “Pension funds investment in infrastructure: A survey”, International Futures Programme Paris, OECD Publishing. OECD (2016), Annual survey of large pension funds and public pension reserve funds 2015, OECD Publishing. OECD (2017a), Investing in climate, investing in growth, OECD Publishing. OECD (2017b), Breaking silos: Actions to develop infrastructure as an asset class and address the information gap – An agenda for G20, OECD Publishing. Revoltella, D, P-B Brutscher, A Tsiotras and C Weiss (2016), “Linking local businesses with global growth opportunities: The role of infrastructure”, Oxford Review of Economic Policy 32(3,1): 410–430. UN (2016), “Industry, innovation and infrastructure: Why it matters? United Nations Sustainable Development Goals: 17 Goals to Transform our World”, United Nations. Woetzel, J, N Garemo, J Mischke, M Hjerpe and R Palter (2016), Bridging Global Infrastructure Gaps, McKinsey & Company.